Polishing concrete floors is a unique way to achieve a durable and cleanable floor without using a coating, like an epoxy or sealer. Polishing creates a sleek, shiny finish to your concrete floor, and can be personalized with a stain or left as the original concrete color. Polishing concrete involves using heavy-duty polishing machines that progressively grind down the concrete surface until the desired shine and smoothness is achieved. The polishing machines are equipped with diamond-impregnated disks that range from coarse to medium to fine, and are used in that order to progressively grind the concrete smoother and smoother. There are two ways to polish concrete floors – wet polishing and dry polishing. Depending on the project, one of these processes may be more ideal than the other, and we are unparalleled in our experience determining which process to use. During the later stages in the process of polishing, a stain guard and a densifier are applied, which eliminates the need for a coating. The stain guard soaks in to the concrete and protects the concrete from stains. The densifier changes the hardness of the concrete so that it is actually denser than it was before and is therefore harder to chip, much more durable, and is very easy to clean. Dye stains are specifically made to be used with polished concrete floors, so you can choose to have a vibrant color change, or keep the concrete in its natural color scheme. 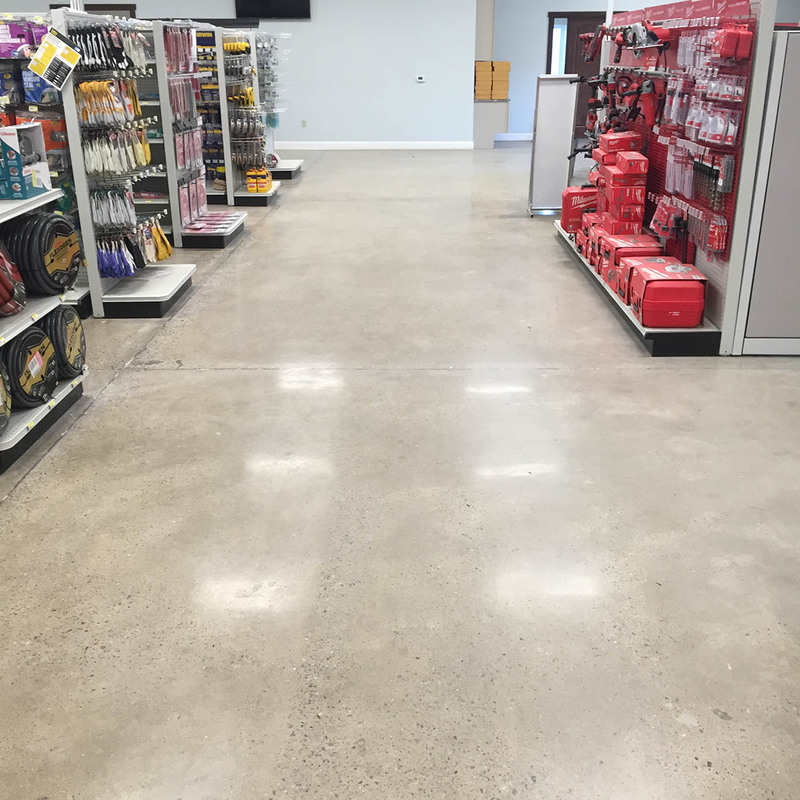 Polished concrete floors are especially useful in large commercial areas, such as warehouses, industrial buildings, commercial/retail spaces, and event spaces, because there is very minimal maintenance for the flooring. 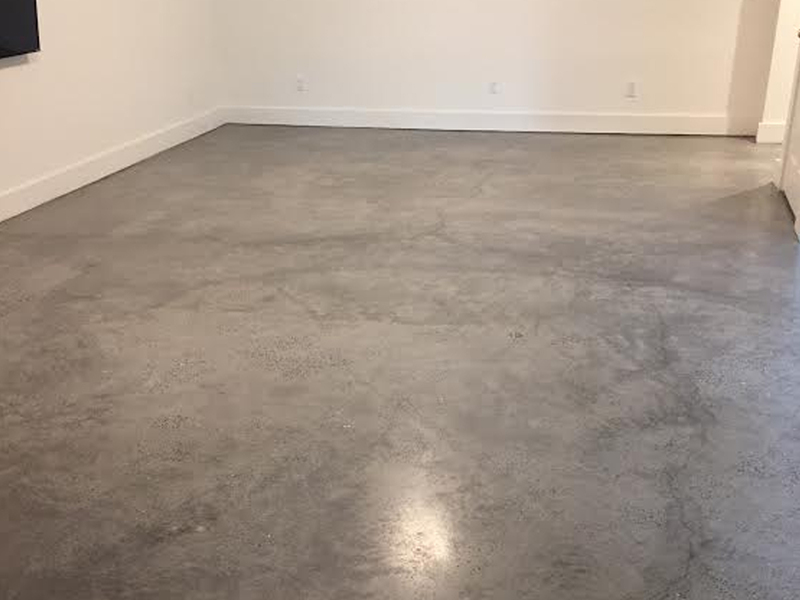 However, polished concrete floors are also a great option for smaller flooring areas in residential and commercial spaces that have moisture issues since it eliminates the need for a coating. Polishing is also the preferred finish technique for marble and terrazzo floors, both of which are beautifully unique flooring options. Let us help you get the polished floor you’ve always wanted, and give us a call today!